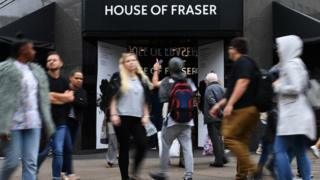 "Some landlords are being very collaborative in order to give us a chance at turning the business around, giving House of Fraser a lifeline and saving hundreds of jobs," a spokesman said. "However, some greedy landlords would rather see the stores close than help save the jobs of hundreds of people. "We will continue to try and convince these landlords but ultimately time is running out. Some closures will be announced." Mr Ashley vowed to save about 47 House of Fraser stores after buying the chain, which he aims to make "the Harrods of the high street". "We will do our best to keep as many stores open as possible," he said.Other House of Fraser stores the new owner says will remain open are Telford, Aylesbury and Carlisle. Sports Direct needs to cut costs if the loss-making department store chain is to remain viable and continue trading, but some landlords are opposing rent reductions of the scale it is demanding. BBC News understands some have been asked to sign deals for rent equivalent to 5% of a store's turnover, while about 28 stores would not get any rent at all but have their business rates paid for.Most landlords will end up taking a financial hit, but some think Sports Direct's proposals will be better than an earlier restructuring deal that would have resulted in 31 stores closing.Offering rates-only deals, or "meanwhile leases", to landlords is an unprecedented move for such a big, established retailer.One retail property expert told the BBC that such an offer would be quite attractive for some landlords: "They continue to trade, without the burden of business rates which gives them at least a year to come up with a plan. "If the stores trade successfully, then there's always the possibility of a better deal with Ashley down the road."